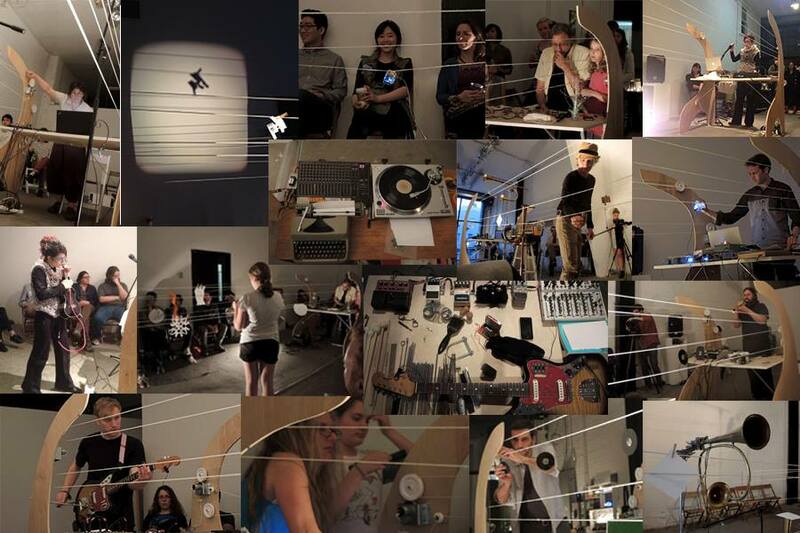 Co-curated by REVERSE gallery, Thessia Machado and Merche Blasco, “Acoustic Formulae” brought together a group of sound artists who work with formulas as outsets for improvisation. TRICOT’s (Thessia Machado and Merche Blasco) installation re(p)l(a)y is a sculptural platform that acts as a dynamic score instrument for the exchange of musical events in electroacoustic improvisation. Throughout the exhibition, several artists will be invited to, via installation and performance, interact with and respond to re(p)l(a)y. Composed of a system of motors and pulleys, re(p)l(a)y allows artists/musicians to exchange instructions and direct each other while playing. During the performances, the guest artists will explore novel formulas in the tangible sonic dialogue that Acoustic Formulae aims to catalyze. A formula establishes a set of elements or actions and the relationships among them. It arranges different forces or positions to achieve a result or to indicate a procedure. Some formulas fail, others make new formulas possible. In Acoustic Formulae, the ratios and agencies of the different elements at play -bodies, voices, hardware, software, and even tea cups- shift during the time of the performance. In this redistribution, new unscripted formulas are generated. Musical improvisation opens up a space for real-time interaction, bringing out nonhierarchical, collaborative, and conversational aural heterocosms: self-contained worlds that offer alternative possibilities. PARTICIPATING ARTISTS: Merche Blasco, Thessia Machado, Ben Owen , Jenn Grossman, Billy Gomberg, Gill Arno, James Kelly, Leslie Ross, Terry Dame, Dafna Naphtali, Hans Tammen, Brendan Landis, Nick Yulman, Lea Bertucci, Leila Bordreuil, Levy Lorenzo, Michael Vorfeld as part of Dark Circuits Festival, Megan Schubert & Rebecca Warner.